By default, forms or quizzes you create in Microsoft Forms can only be shared with teachers and students at your school. If you'd like to grant guest access to a form, such as to a parent or guardian, follow the steps below. Sign in to https://forms.office.com with your school log-in. Select the form or quiz you'd like to share in the My forms tab. 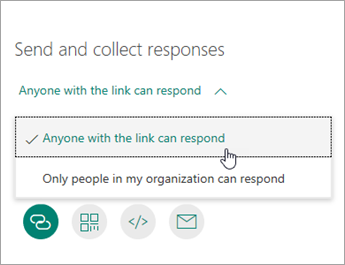 Beneath Send and collect responses, select Anyone with the link can respond. Copy as a link: To post to your school website or personal page. Create a QR code: Have parent or guardian use their mobile device to download the form or quiz. Embed: Get the HTML code so you can put it on your website. Email: Send a link to your Parent via email.